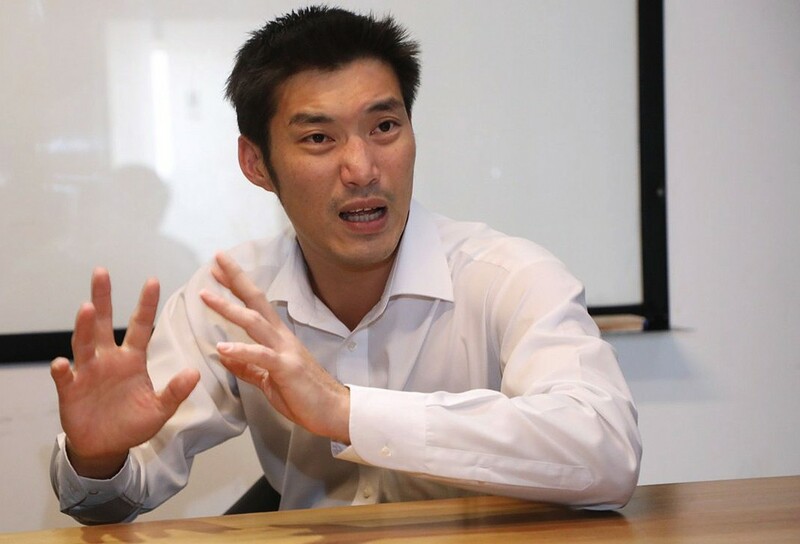 In a tense stand-off between the establishment and the ‘new guard’, Future Forward party’s brash young leader, Thanathorn Juangroongruangkit, is firing verbal missives at the NCPO. Reuters is reporting that the new Thai party, headed up by auto-parts billionaire Thanathorn, and aiming to shake up politics, hit back at the ruling junta today accusing it of “tarnishing the image of the southeast Asian nation by filing police charges against some party members”. Using the same Facebook page which has already got Future Forward and 39 year old Thanathorn in trouble, they posted statements today condemning the NCPO’s reaction to a Facebook Live broadcast they did last week. “The results of these actions have impacted and damaged the image of the country,” it said on its Facebook page. Reuters reports that the party launched this year, hoping to woo young people and win backing from those seeking an alternative to military rule. Read the rest of the Reuters report HERE. Thailand’s Cabinet has extended the waiver of the fees for ‘visa on arrival’ for some foreign tourists to Thailand. The waiver of the 2,000 baht VOA fee will be extended to at least October 31. The fee had previously been waived until January 14 this year in a bid to boost tourism. It was then extended until April 30 and has now been extended again. According to the Ministry of Sports and Tourism, waiving the VOA fee had helped support the increase of foreign visitor numbers. Between November 15, 2018 to March 31, 2019, 3.58 million foreigners visited Thailand, an increase of 83% compared to the 1.6 million visitors during the same period in the previous year. 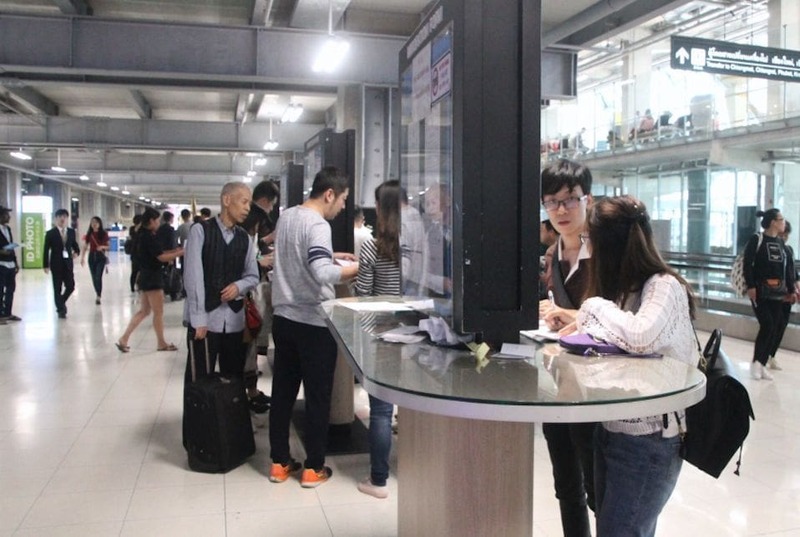 Meanwhile, waiving the VOA fee resulted in the government losing 2.95 billion baht in revenue but the extra tourists generated an estimated 105 billion baht in tourism revenue. The Visa On Arrival waiver is available to tourists from 21 countries and regions, including China and India. The Treasury has reported that orders have been placed for more than 3.6 million souvenir coins of different models that are being especially minted to mark the May 4 coronation of His Majesty the King. 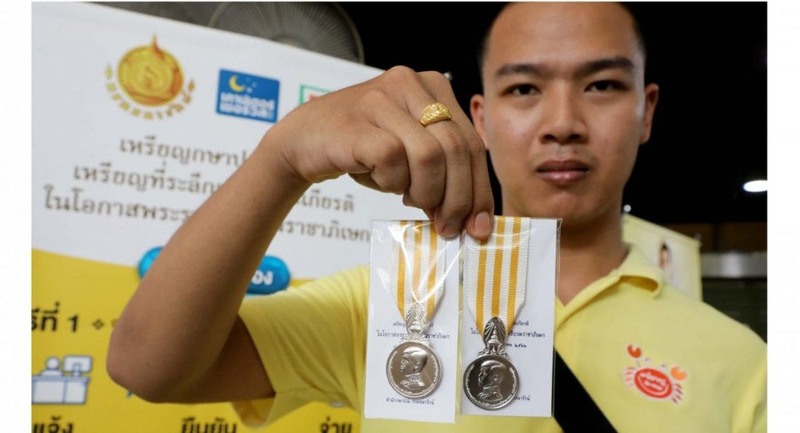 The orders include 200 for the highest value platinum coins worth 1 million baht apiece, and 10,000 for gold coins, department chief Amnuay Preemonwong said. The department has also extended the booking deadline from April 4 to May 10, while the coins will be delivered from June 1 onwards, he said. A large number of people have been showing up to place orders at the Treasury Department on Rama VI Road in Bangkok as well as at its related offices in provinces, including the pavilions set up in Chiang Mai and Songkhla. The department will produce limited quantities of three types of souvenir coins without engraved values. Only 1,000 platinum coins, worth 1 million baht apiece, will be minted; no more than 100,000 pieces of the blackened and sandblasted silver coins worth 5,000 baht apiece will be minted; and 100,000 pieces of the blackened and sandblasted copper coins, worth 3,000 baht apiece will be minted. The department will also produce three types of commemorative coins with engraved values as follows: 50,000 gold coins with 19,000 baht denomination priced at 40,000 baht apiece; 100,000 silver coins with 1,000 baht denomination selling at 3,000 baht apiece; and 5 million cupronickel coins with 20 baht denomination going for 20 apiece. 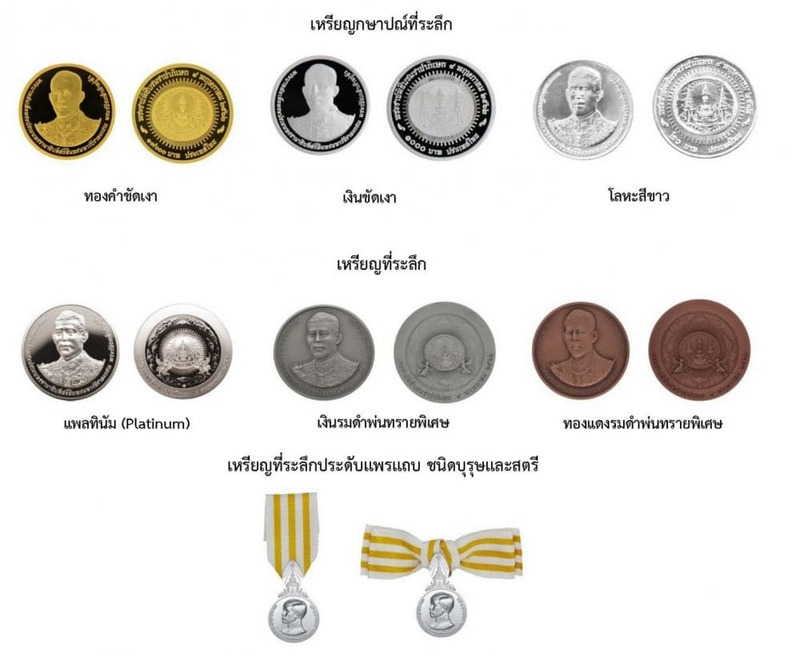 The department will also produce 500,000 sets of commemorative medals priced at 1,600 baht each. 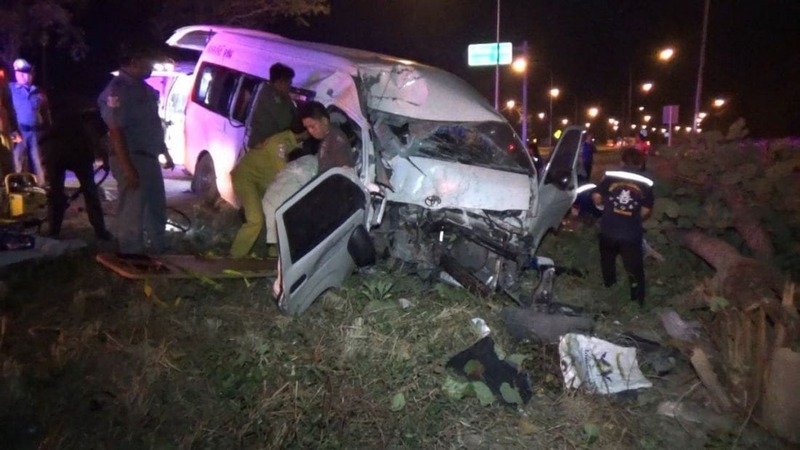 A van driver has been killed and 10 migrant workers injured after the passenger van careered into a roadside ditch and hit a tree in Khamphaeng Phet in Thailand’s central west today. 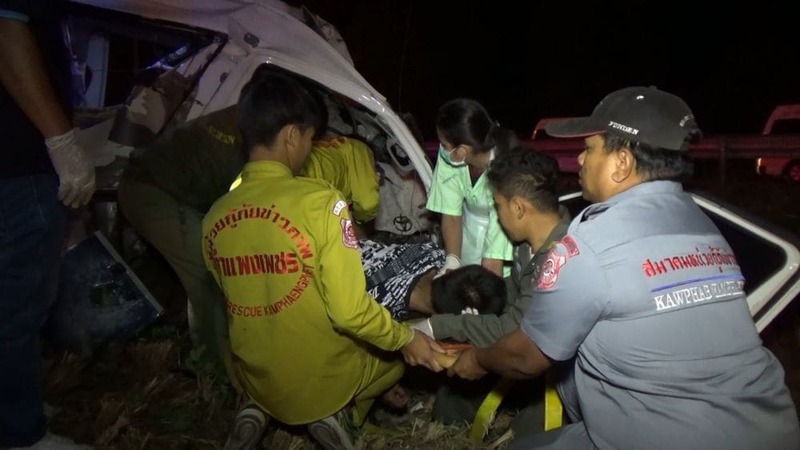 The 27 year old van driver was killed and 10 Burmese workers were injured when their vehicle crashed in Khamphaeng Phet’s Kosamphee Nakhon district early this morning (Thursday). Police believe the driver, Thongpoon Chanachan, fell asleep at the wheel and died instantly in the collision. He was taking the migrant workers from Bangkok to renew their visa in Tak. Rescue workers found the Toyota van with the wrecked front section stuck to the toppled tree when they arrived at the scene on Phaholyothin Highway at 4.30am. They had to use heavy equipment to extract two of the injured passengers from the wreckage. 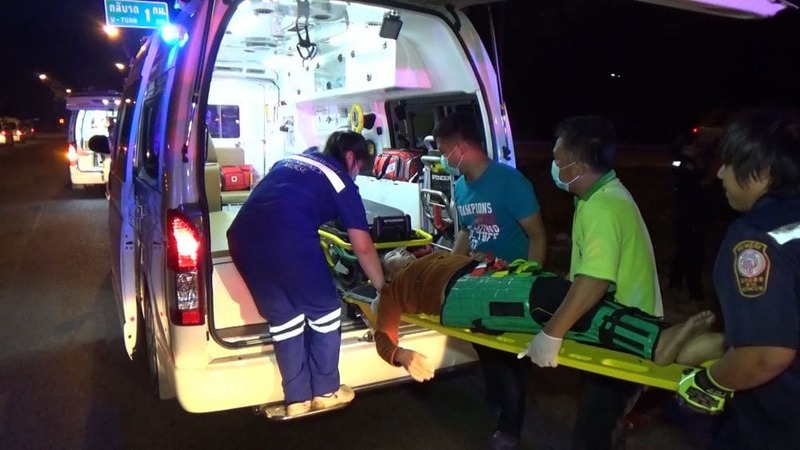 The other slightly injured passengers told police that they left Bangkok at 10.30pm on Wednesday to renew their visa in Tak’s Mae Sot district, on the border with Myanmar. All the passengers were asleep when the crash happened.